One of the great advantages I had when I was researching my Santa Fe Seligman family was the availability of numerous newspaper articles about members of the family. Because my great-great-grandfather Bernard Seligman and his son Arthur Seligman were both important business and political leaders in Santa Fe, there was extensive coverage of their lives—and not just their business and political lives, but also their personal lives. The news articles gave me great insights into their personalities and the way they were perceived in their communities. Now my cousin Wolfgang Seligmann has uncovered more articles—not only about the Santa Fe Seligmans but also about their relatives abroad. My favorite article of those uncovered by Wolfgang is this one, an obituary of my three-times great-grandmother Babette Schoenfeld Seligmann from the February 2, 1899 issue of the Santa Fe New Mexican. Hon. 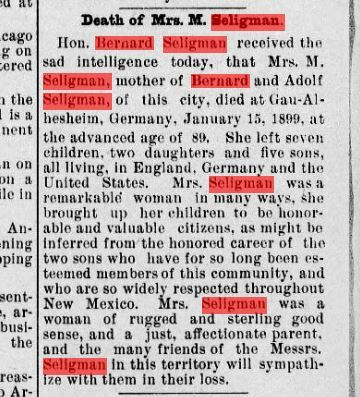 Bernard Seligman received the sad intelligence today, that Mrs. M. Seligman, mother of Bernard and Adolf Seligman, of this city, died at Gau-Algesheim, Germany, January 15, 1899, at the advanced age of 89. She left seven children, two daughters and five sons, all living, in England, Germany and the United States. Mrs. Seligman was a remarkable women in many ways, she brought up her children to be honorable and valuable citizens, as might be inferred from the honored career of the two sons who have for so long been esteemed members of this community, and who are so widely respected throughout New Mexico. Mrs. Seligman was a woman of rugged and sterling good sense, and a just, affectionate parent, and the many friends of Messrs. Seligman in this territory will sympathize with them in their loss. The Sante Fe New Mexican reporter could not have known Babette, so the descriptions must have come from her sons Bernard and Adolf. They reveal so much about Babette’s personality and how she was perceived and loved by her sons. 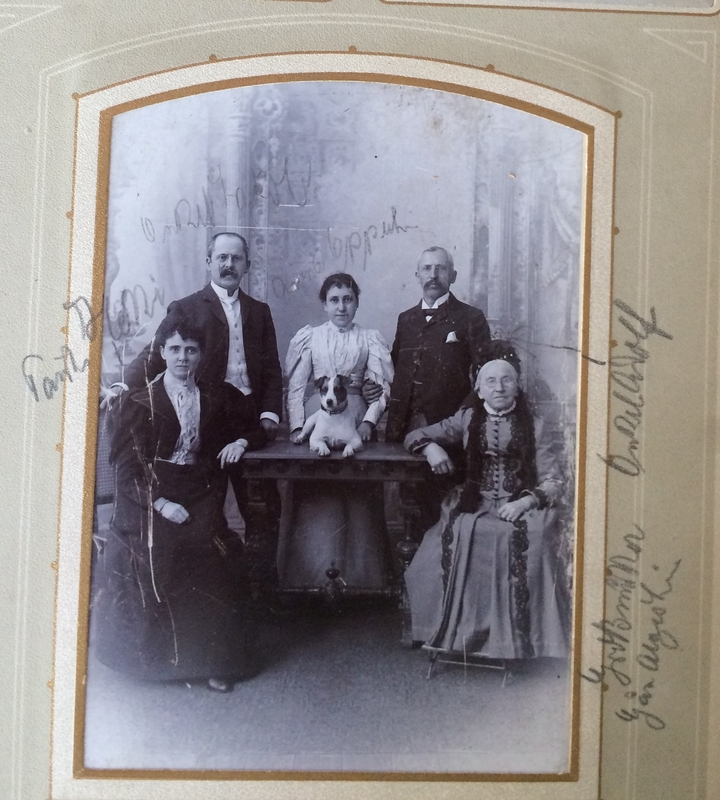 Far right, Babette Schoenfeld Seligmann with two of her sons, Jakob/James and Adolf, James’ wife Henrietta, and in the center, granddaughter Anna Oppenheimer. I thought this little news item that Wolfgang found was also interesting. It is an announcement of the dissolution of a London wine business owned by three of the Seligmann brothers: Wolfgang’s great-grandfather August Seligmann, his younger brother Hieronymus Seligmann, and the youngest sibling, James Seligman. James, who was born Jakob, was the brother who left Germany for England and Scotland, unlike my great-great-grandfather Bernard and his brother Adolf, who went to New Mexico, or August and Hieronymus, who stayed in Germany. The notice announced the takeover of the wine business in England by James alone as of the end of July, 1890. I knew that James had been a wine merchant, but was not aware that his brothers were his partners initially. James was ultimately quite successful and, according to my cousin Lotte, owned hotels in Great Britain. 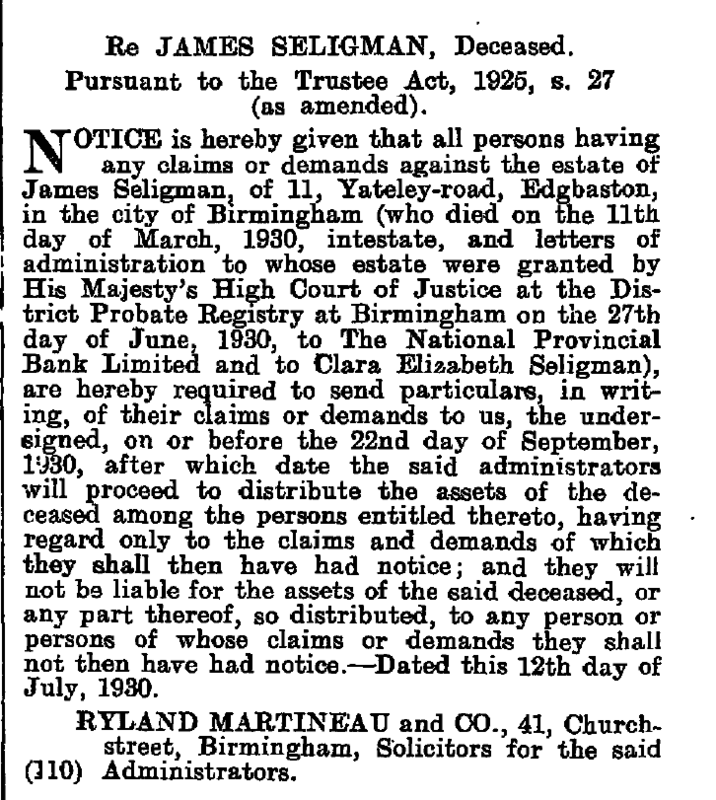 Wolfgang also found a notice in the July 15, 1930 issue of the London Gazette notifying those with possible claims against the estate of James Seligman of his death on March 11, 1930, and outlining what they needed to do to pursue those claims. It’s interesting that a man as successful as James died intestate (i.e., without a will). The National Provisional Bank Limited and James’ widow Clara had been appointed administrators of his estate. 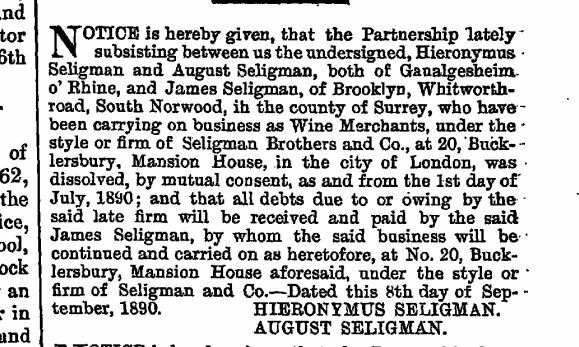 It was the settlement of James Seligman’s estate and the bank’s search for his heirs that led me to so many other Seligmann relatives. Two articles that Wolfgang sent were stories I’d not seen before about my great-uncle Arthur Seligman. The first is a profile of him published in the January 13, 1904, Santa Fe New Mexican (p. 9). The biographical information I have reported elsewhere so I will just quote a few excerpts from this article, written when Arthur was a County Commissioner in Santa Fe. 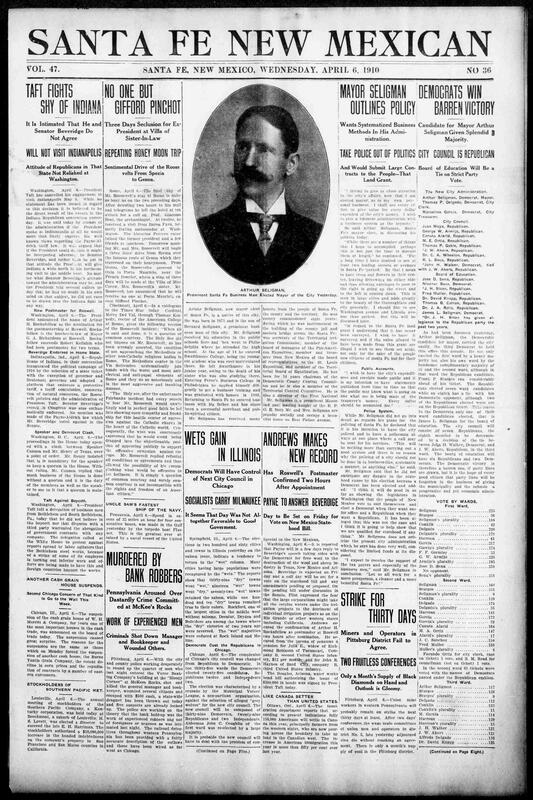 Six years later Arthur was elected mayor of Santa Fe and was featured on the front page of the April 6, 1910, issue of the Santa Fe New Mexican. The articles provide a biography and a description of his plans for Santa Fe during his upcoming term as mayor. Twenty years later, Arthur would be elected governor of New Mexico. 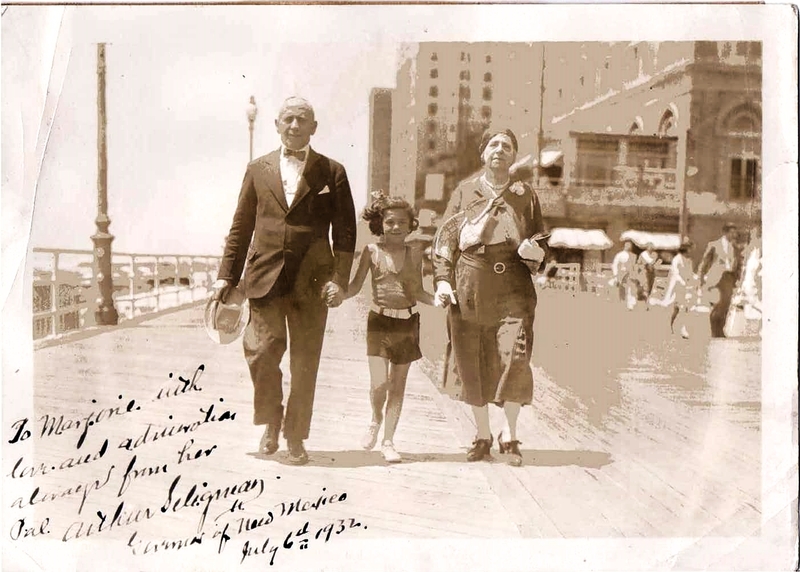 Here he is attending the 1932 Democratic convention in Atlantic City, accompanied by my cousin Marjorie Cohen and my great-grandmother Eva Seligman Cohen, his sister. Much thanks to my dear cousin Wolfgang for finding and sharing these articles about our relatives. This entry was posted in Gau-Algesheim, Genealogy, Germany, Santa Fe, Schoenfeld, Seligman/Seligmann and tagged Gau-Algesheim, Germany, Santa Fe, seligman, Seligmann by Amy. Bookmark the permalink. Hi Jo!! Thank you for reaching out. I will be in touch by email very soon (was on the road today and still catching up). Wonderful articles and photos. I love the obit and her photo in the group shot. I’m quite taken by that photo that features the dear pet in his kingly position at the center of the family ;)! It’s so wonderful to have so many articles! I do love the dog there—it makes me think that these ancestors had that animal loving gene that I most definitely share. 🙂 Thanks, Luanne. I am sure they did! It is adorable. Nice to have these. I gave an obituary of my great grandfather. It adds to the connection. Wonderful that you are putting more flesh on these ancestors’ bones. I read the lawyer’s announcement for James Seligman, and his address totally popped out at me. I worked in Birmingham in the early 90’s and used to drink in a pub near Yateley Road. I have no idea why I remember that particular street name, but it was such a cool thing to see it (and remember my slightly wilder days). It is such a small world. Think of all the times and places our ancestors might have crossed paths. I do believe that there are truly only six degrees of separation. So do I! Actually in NZ, it’s probably less than that. It’s a small country, and we’re notoriously informal. Come on Amy! I’m sure you can find someone who knows the pet dog’s name. Seriously, these articles are wonderful additions. I was looking at newspapers for Luxembourg yesterday and found a short one-liner about my great-great-grandfather. Turned up something I never knew. Thanks, Cathy—I agree. I am so glad Wolfgang found them. I look forward to hearing about your discovery. And let’s just say the dog’s name was Bingen! What a wonderful post. Great pictures, I too loved the dog, who fit into the photo perfectly. I am so amazed by all the wonderful detail given in all the accounts. A goldmine of information and family history Amy. Thank you, Sharon! I know—newspaper articles add so much flesh to the bones! I just love newspaper articles about our ancestors! Such a different time and the way things were described like the “sad intelligence”. But the best part is reading the comments and seeing a new cousin has found you! Yes! As always, i am thrilled when a new cousin finds me! And I also love newspaper articles as I know you do. They give us those peaks into personality and perception that census records and birth certificates never can. Thanks, Debi! Finding out who shared in the proceeds of James’ estate would make a fascinating follow-up, if such research is within reach. Oh, that’s all done. I wrote about the heirs named in the will a long time back, perhaps before you were following my blog. Unfortunately my father was not one of those identified though he should have been. But his share would have been very small as there were many, many heirs! Well at least it went to rightful heirs and not the government. They get enough in taxes no matter what the country. I misspoke or miswrote. There was no will, but the bank did an investigation to find the legal heirs. They just didn’t find my father’s line in James’ extended family. But the other family members divided the estate. What a great post, Amy! I love the stories and photos. The image of the newspaper from when Arthur was elected Mayor is especially cool. Great finds by your cousin, I’m glad he shared them with you. Thank you, Amberly! I am so glad he shared them.